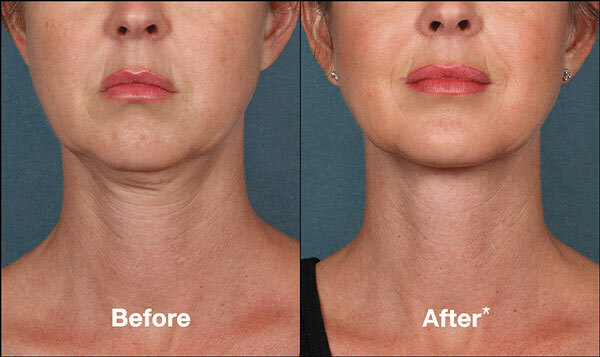 KYBELLA is an FDA-approved non-surgical injectable treatment designed to reduce fat volume beneath the chin. 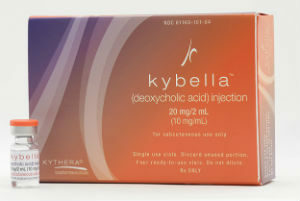 The active ingredient in KYBELLA—deoxycholic acid—naturally occurs in the body. When it is injected into superficial fat deposits, fat cells are broken down (metabolized) by the body for a leaner, more defined chin, jawline, and neck profile. We offer customized treatment KYBELLA at Copeland Cosmetic Surgery that can help you look and feel your best. If you would like to learn more about KYBELLA, we encourage you to explore the informational sections provided below. You may also contact our office to schedule your one-on-one KYBELLA consultation. The appearance of a double chin or fullness below the jawline is a common cosmetic concern that many women and men struggle with.  Prior to KYBELLA, facial liposuction techniques or the excision of fat tissue during neck lift surgery were the only options for removing this type of stubborn, localized fat. Now, KYBELLA is frequently recommended as an effective way to reduce a mild to moderate amount of excess fat that doesn’t respond to traditional weight loss methods. For further facial enhancement, many patients choose to combine KYBELLA with other cosmetic treatments and/or plastic surgery procedures. During a personal consultation our plastic surgeon, Jeffrey Copeland, MD can use his expertise and experience to develop a customized facial rejuvenation treatment plan based on your concerns and aesthetic goals. If you are interested in finding out how KYBELLA or another cosmetic procedure can improve the contours of your jawline and neck, we invite you to contact Copeland Cosmetic Surgery to schedule your consultation. 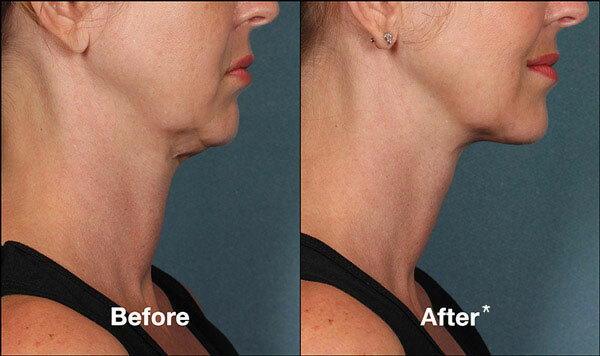 What Happens During the KYBELLA® Treatment? KYBELLA treatments are typically well-tolerated as a result of a topical anesthetic applied prior to the injections. Once the skin is adequately desensitized, Dr. Copeland injects small amounts of KYBELLA using a thin micro-needle. The injections are meticulously placed throughout the treatment area for even distribution of the product. Treatment typically takes about 30 minutes, but this may vary depending on the unique details of the treatment plan (i.e. the size of the treatment area, thickness of the fat deposit(s), etc.). What Are the Side Effects of KYBELLA®? Immediately following KYBELLA injections, ice is applied to the treatment site to mitigate potential swelling and redness. It is common for the treated area to take on a certain degree of inflammation and redness as the active ingredient in KYBELLA sets to work within the tissue. These effects tend to subside completely over the next few days, and patients often choose to go about their regular activities soon after treatment. Light bruising may also develop, which is often easily concealed with makeup and generally dissipates quickly along with any inflammation. The full results of KYBELLA injections develop over a period of three to four months, and patients typically have the option to undergo more treatments if additional fat reduction is desired. Individuals who have struggled with stubborn fat beneath the chin—due to genetics or other reasons—are usually thrilled with the results they achieve with KYBELLA.  The aesthetic improvements our patients experience often have a significant positive impact on the overall appearance of the face, neck, and profile. Since KYBELLA permanently destroys and metabolizes fat cells, the results are generally long-lasting; however, it is important to understand that outcomes achieved with KYBELLA can be compromised by significant weight gain in the future. During your consultation, Dr. Copeland can calculate a price estimate for your KYBELLA treatment plan. We accept payment with major credit cards and loans through CareCredit®, a trusted third-party healthcare lender. If you are considering plastic surgery financing, we recommend asking questions at your appointment and filling out the online application for CareCredit® to see if you qualify. Contact Copeland Cosmetic Surgery to learn more about KYBELLA and other innovative injectable products we offer.